The above image is from a Zevzda model box. Note the "corvus" at the fore. The (classis)(naval fleet) provided the Roman army with both sea power and logistical support. The Roman navy was always considered inferior and was under the control of the army. Initially, ancient Romans had no great love of the sea. It was during the first Punic War that it became a necessary for a strong navy to be built. Rome were surrounded by other Mediterranean nations who had already had large fleets and much experience in seafaring. The Romans relied on the accomplishments of foreign navies in developing their own. Contrary to popular belief, the navy did not use slaves. The rowers, sailors and soldiers were auxiliaries receiving citizenship after serving for 26 years. Though most came from a seafaring community, this was not a requisite to join. The officers came from the Roman equestrian class. In Imperial times they often were freedmen from the Imperial household. 1. The first Roman ships were built by following the example of captured Carthaginian vessels, combined with the expertise supplied by the Greek cities of southern Italy. The Carthaginians designs were reflections of early Greek and/or Phoenician ships. Foremost among these was the trireme. The trireme was built for speed and mobility. The triremes were 120 feet long, and were powered by rowers arranged in three rows. The crew was made up of 200 men: 170 rowers (1 man to each oar) and the rest were officers, sailors and marines. There were 62 men rowing at the top level. There were 54 men rowing at each of the lower 2 levels. 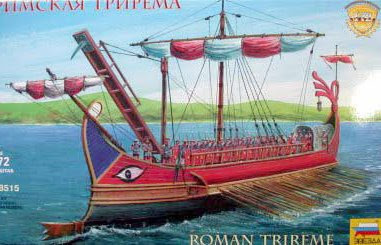 The commander of a trireme was trierarch. The oarsmen chief was the hortator (one who exhorts or encourages). They were built low to the ground, the bottom row of rowers were just 18 inches above the waterline, and very narrow. The displacement of a vessel reached 230 tons, length - 45 meters. This all meant that the triremes could not handle rough seas. The oars on triremes were of various length. The triremes were built for short, close in, battles. They were not made to handle long, open ocean campaigns. The rigging consisted of a large rectangular and small sails on the sloping mast in a row of a vessel. The triremes were very maneuverable and fast: 7 - 8 knots (a number based on modern reconstructions of the craft). Based on the basic design of the trireme, the quinquereme became the standard battle ship. One might assume that the "quin" (latin for "five) in "quinquereme" refered to five levels of ours, just as a "tri"reme had three levels. However, it would be very difficult to row a ship with more than 4 levels of oars, so it is more likely that the "quin" refered to the files of rowers. So if you were to stand on one side of the top deck and look bellow to the rowers, you would see 2 men rowing at the top level, 2 men rowing bellow them, and on rowing at the bottom level. 2. In the latter half of the 1st century BC, a new style of ship-building was introduced, borrowed again from enemies of Rome. The liburna, was so called because it was developed from the ships used by the Illyrian pirates of Liburnia (in the mondern-day Balkans). It had only two rows of oars, and the Romans came to prefer it because of its greater speed and maneuverability. 3. After the battle of Actium (31 B.C.) the main purpose of the navy became transport. The ships of the Republic (from about 260 B.C. to 50 B.C.) had been vessels intended primarily for combat, with full decks to provide a large area for mustering soldiers, a powerful ram, and an easily removable mast allowing a high degree of maneuverability. Reflecting the fact that there was no longer an existing enemy fleet to deal with, the Cabins now became the norm. Some ships had two (usually at the stern, but occasionally at the prow), suggesting an increased level of comfort: important if galleys were to be used for the transportation of dignitaries. The traditional weapon of trireme was battering ram - a prolongation of a keel beam, strengthened with metal. During the battle triremes advanced to maximum speed to attack with a battering ram. The ship was either aimed directly into the side of an enemy ship to sink it. Or it was driven close in and alongside the enemy, snapping the enemies oars in half as it went, thus deprive its movement. II. Send in the Marines! 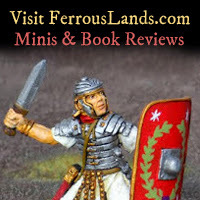 During the first Punic War, the logical Romans came up with the idea idea that a warship was little more than a floating platform on which the soldiers could fight. They invented a huge boarding plank with a large spike on the end, which could be raised and lowered like a drawbridge. Before battle it would be raised and then dropped onto an enemy deck. The spike would embed itself into the enemy deck planking and the legionaries could board the enemy vessel across it. This elaborate beak contraption was called thecorvus (raven). Mounted artillery and personal range weapons added fired from the deck gave the Roman ship firepower. Slings and arrows could be used against the enemy sailors. Varying types of catapults, shooting hefty stones or bolts, could be used as antipersonnel weapons or could launch flaming projectiles against the enemy ship itself. Temporary wooden towers built on the deck improved the angle of fire. The 7th century Byzantine Navy, a continuation of the Eatern Roman Navy, created and even more potent weapon, greek fire. This mysterious combustible concoction could be blasted from bronze tubes onto enemy ships. Water alone could not extinguish its flames. The recipe for this weapon was so closely guarded that within only 50 years of its invention, the knowledge was lost even to the original owners!